Joe Perez and Emily Reynolds appear on the CCHS Tiger Talk video announcements daily. I’m pleased to announce that on Monday September 24th all five Cañon City Schools Board Directors voted to officially adopt the four core beliefs we have been promoting as the school year began. This week I noticed several examples of core belief number three in action, we’re future-focused, believing the development of certain traits and skills will best prepare our students for ever-changing careers. I want to thank Cañon City High School teacher Andy Fisher for his tireless work establishing a daily video announcement system. Andy has been working with Head Boy Joe Perez and Head Girl Emily Reynolds on this project, and it has been an absolute pleasure to watch the daily process grow more and more creative. I encourage readers to subscribe to the Tiger Talk YouTube feed at this link. https://www.youtube.com/channel/UCch7o07oLdd4Usbyp_plhpQ. I also want to offer a special shout out to CCHS teacher Jamie Reed who has been supporting this project as well as our high school video productions class. This is a prime example of a high school with a future focus! I also noticed that after much hard work the Harrison K-8 library established and is now operating a Maker Space. The concept behind a Maker Space is to allow students a supervised area to innovate and display the trait of agency. Most important, a school based Maker Space also helps to level the playing field for students who may not have proper supports at home when it comes to completing large scale projects. A big thank you goes out to the Harrison Building Leadership Team and Librarian Janet Hidalgo for getting this project off the ground! 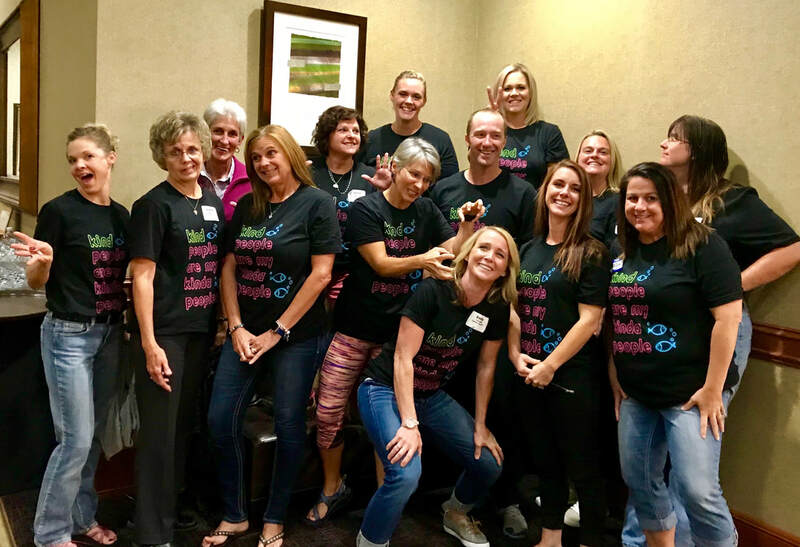 Fremont County Regional health and Wellness program School Health Professionals attended the Colorado SHP Conference last week. This week I also noticed staff exemplifying core belief number one, we meet the social-emotional needs of all students, putting Maslow’s Hierarchy of Needs before Bloom’s Taxonomy. First, Cañon City High School Assistant Principal Michelle Johnson has been working tirelessly setting up a student mindfulness program, in the process organizing and conducting some well-attended staff training. This effort is aimed at helping staff support students at all levels to take a step back, when they are stressed, to support better academic focus and behavior. Thank you for taking the lead on this Michelle. You are a prime example of how we put Maslow before Bloom! On another front, I know many folks from our region attended the Colorado School Health Professionals conference last week and reports from Assistant Superintendent of Schools Adam Hartman lead me to believe Fremont County has much to be proud about the way its schools are taking full advantage of these resources. The SHP grant program allows schools to place additional certified nurses and counselors in their buildings to support the teaching of growth and development curriculum as well as student social-emotional wellness processes. Mr. Hartman says based on his observation we are doing some of the best work in Colorado on this front. Kudos, and thanks, to all! New Board Director Robin Reeser was sworn in by Board President Larry Oddo. Our Board of Education recently received nine letters of interest and interviewed eight candidates before making a decision to fill Kristyn Econome’s open director seat. Last Monday the board appointed Robin Reeser to fill that seat. Mrs. Reeser was sworn in Monday evening and will serve the remainder of Kristyn's term through early November 2019. Mrs. Reeser has an extensive background both in finance and education. She grew up in Kentucky and then worked in the budgeting department at the University of Houston and later served as Assistant to the President of Budget and Finance at Texas A and M University. Though the early part of her professional career focused on finance, Robin has deep roots in the field of education, with her father having served as a public school administrator for many years. After relocating to Cañon City, Mrs. Reeser served in several capacities for the Cañon City School District, including attendance clerk at Cañon City High School and 5th-grade math teacher at Harrison K-8. Robin continued her career in education as an adult math instructor at Territorial Prison and then at Pueblo Community College’s Fremont Campus. Since retiring Robin has pursued a career as a realtor, working for the Cañon City office of Coldwell Banker. She and her husband Pete live in Lincoln Park not far from McKinley Elementary School. Together they have raised five children. Robin also currently serves as the board chair of the Fremont Arts District. The Fremont County Workforce Learning Board meeting was well attended last week. Last week we held a biannual Fremont County Workforce Learning Board meeting. During the session Cañon City High School Vocational Machining teacher Jake Hogan and Vocational Business teacher and Eric House presented key aspects of their programs. During the meeting Mr. House announced an effort by his business software class to offer personal development opportunities for CCSD staff and community members to become more skilled in using software such as Microsoft Excel and Quickbooks. These courses will be taught my CCHS students. 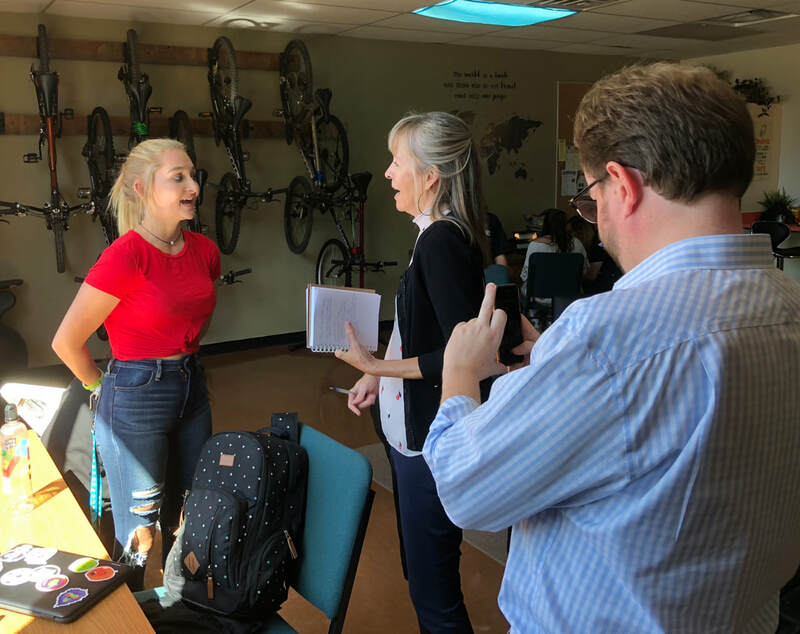 At the meeting it was also announced that 100 intern and apprentice opportunities have already been established in 62 local businesses this semester, compared to only 95 for the entire school year last year. We already have 100 scheduled for the spring semester of 2019. PAICE Coordinator Lisa Tedesko reported we now have more businesses interested in participating than we have students available at this time. What a nice problem to have, and what great community support! Lisa said this will likely change over time with the implementation of our pathways curriculum. She reported the primary program goals for this year include continuing to promote the program, building greater capacity in students to participate, and engaging even more business partners. Thanks to the efforts of CCHS Assistant Principal Michelle Johnson, a cross section of CCSD staff were able to participate in Mindfulness Training. Our primary task the past few weeks has been securing clear title to the Washington Elementary property in advance of the state sale of Certificates of Participation aimed at financing the new building project. Two factors have complicated this for us. One is the Washington property was listed as collateral for a no interest QZAB building improvement loan executed about 10 years ago. This issue was quickly solved by executing an early balance payoff of the loan. The Board of Education approved this at its September 10th meeting. The second difficult factor is the cooperative agreement we have related to the solar panels on the current Washington facility roof. However, Director of Operations Jeff Peterson and Director of Finance Buddy Lambrecht have been working diligently to secure permission to move these to some open field space we have near Harrison School. Last week I participated in a Monday board work session and meeting, conducted some student expulsion hearings, sat in on our weekly SAC meeting, facilitated a monthly Instructional Leader PLC, attended a quarterly Fremont County Workplace Learning Board lunch meeting, attended an Educate GATE evening presentation, and met with Southern Peaks personnel to discuss the possibility they might provide day treatment for some students in need. On Thursday I also had the pleasure of sitting in on a visit by Colorado Association of School Boards representatives to our Tiger Open Pathway program. CASB was on site in consideration of the program possibly receiving a Student Achievement Award at its annual convention on December! CASB visitors interview one of our Cañon City High School Tiger Open Pathways students. 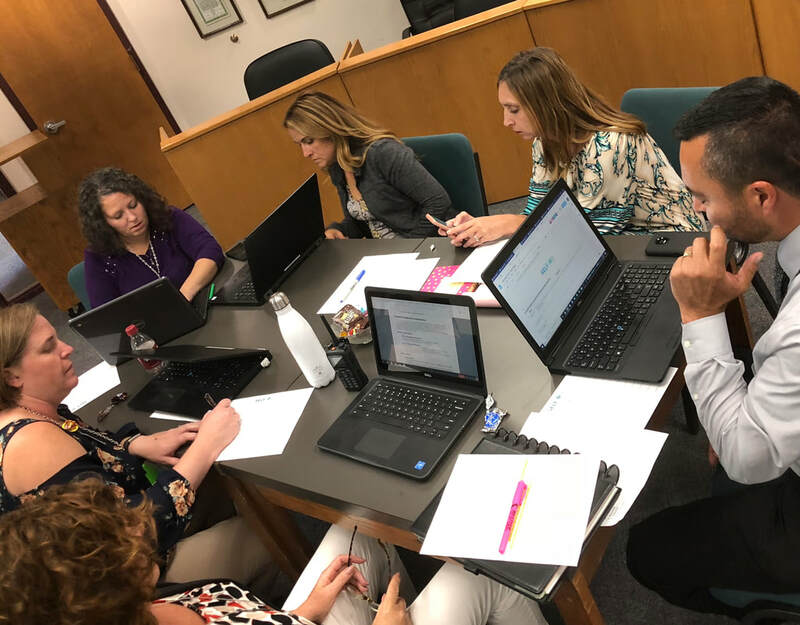 A group of CCSD instructional leaders work together developing definitions for key skills we would like to develop in students. This week I have a light schedule on Monday. On Tuesday I'll participate in another round of PCC-Fremont Campus Dean interviews. I'll also attend CCMS and Washington design meetings on Tuesday and Wednesday. I have a series of routine meetings on Wednesday and Thursday, including our second IBS session on Attracting and Retaining High-Quality Staff. I have a light schedule so far for Friday, though Assistant Superintendent of Schools Adam Hartman and I will attend a Cañon City Community Agency Grant interview on behalf of CCEOE. Amendment 73 language is highlighted on the left, notes on the right put each section in more understandable language. 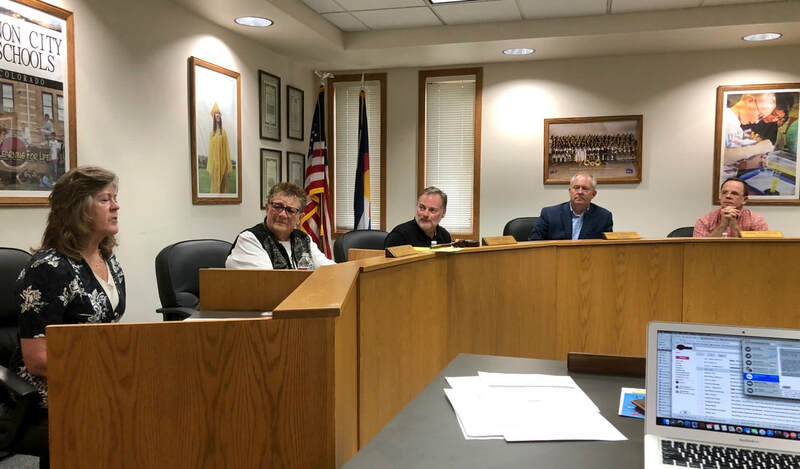 In my September 16th installment of Echoes from Cañon In announced that on September 10th our Board of Education passed a resolution in support of Colorado Amendment 73. In it the Board directed me to distribute a factual summary about the measure to Cañon City School District residents. To do so, I will be writing a series of Other Voices columns to answer for each of you the Who, What, Why, and How of Amendment 73. This first installment is designed to answer the question; what is Amendment 73? The simple answer is a voter initiative designed to change the Colorado Constitution allowing for the collection of $1.6 billion in additional revenue to be invested in PK-12 public education, with local boards of education given the authority to choose how best to invest dollars for the benefit of students. To help folks gain a better understanding about what you'll see on the ballot, I've attached a notated image showing Amendment 73's official ballot language. 2. Amendment 73 would also increase the tax on corporate income by 1.37%. This would not adversely impact small businesses and agricultural operations. It is aimed at large corporations. 3. Amendment 73 would also lower and freeze non-residential property tax rates as they apply to school districts only. There have been many questions about how the passage of Amendment 73 would impact special districts like those that provide recreation and firefighting services. The answer is the current taxing circumstances for such districts will remain exactly the same whether Amendment 73 passes or does not. 4. Finally, Amendment 73 would then create a dedicated education fund from which new revenue collections will be distributed to school districts. Included in this provision is a suggested update to make Colorado's school finance formula more equitable (this would greatly benefit floor funded districts like Cañon City Schools). However, as distributed through the current school finance formula, the Cañon City School District would receive an additional $6 million per year in operations funding should Amendment 73 pass. This is certainly not all the information citizens will need to be well informed about Amendment 73. It is simply aimed to be a start. In follow-up communications, I'll share why this measure has been placed on the ballot, who is behind it (as well as who is opposed to it), more specifics about the impact it will have on taxpayers and school districts in Fremont County, and how our Board of Education has committed to investing anticipated Amendment 73 proceeds in services for the benefit of kids. I look forward to continuing this conversation next week. Thanks so much for listening once again!